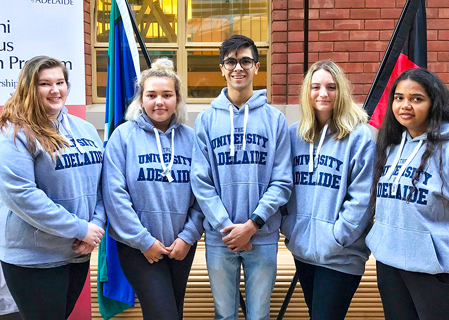 Nathan Hartman and Summa Jackson The University of Adelaide’s commitment to Indigenous education has been further enhanced by a new initiative designed to help Aboriginal and Torres Strait Islander high school students reach their full potential. The Karnkanthi Indigenous Education Program will assist high-achieving students in Years 11 and 12/13, providing tailored support that complements the existing school curriculum. This includes private tutoring, personal and career development and financial support for travel and accommodation. There will also be a strong focus on building resilience through providing cultural knowledge and perspectives. The University’s Dean of Indigenous Research and Education Strategy, Professor Shane Hearn, says there are many high-achieving Indigenous young people who can succeed at university “with the right support in place to buffer them against environmental risk”. “For many high-achieving Indigenous students, performance drops off in their senior years as everyday life becomes more challenging, they try to fit in with peers, they lose motivation, or because of society pressures and negative stereotyping,” he says. The University’s Wirltu Yarlu Education Centre will facilitate the program. Staff will work closely with parents and communities to help them support the students and keep them on track to achieve their academic goals. “Students and their families are empowered to self-identify potential risks and barriers to success, and together we come up with remedies to mitigate them,” says Professor Hearn. Students will also have access to experiential learning and development to help them stay motivated and engaged. Professor Hearn says this could include participating in a program run by a group held in high esteem in the Indigenous community, such as the leadership program run by the Port Power Football Club, or having students meet with Indigenous people working in the professions they aspire to enter. Year 12 student Hannah Brooks participated in a pilot of the program earlier this year and was given the opportunity to visit Canberra to meet Government Ministers in Parliament House. Hannah, who is 17, plans to study a combined law and arts degree so she can pursue a career in law and psychology with an Indigenous focus. “Since starting the program and University Senior College, my grades have lifted and I feel more prepared to take on university next year,” says Hannah.